1939 Top 20 Hits. 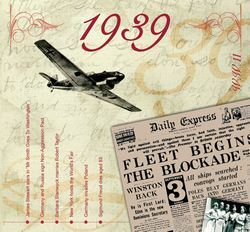 The Music of 1939 will come flooding back to revive memories when they play this CD. It contains many of the top songs for a really thoughtful 80th birthday idea. With 20 of the top hits, this CD will become a meaningful gift to be remembered. the 1939 songs that are on this CD are: We doubt that you'll go wrong with this music! 1. Glenn Miller - In The Mood. 2. Billie Holiday - More Than You Know. 3. Gene Autry - Back In The Saddle Again. 4. Jimmie Lunceford - 'Taint What You Do. Listen to track5. Benny Goodman - Flying Home. Listen to track6. Duke Ellington - Battle Of Swing. 7. John Kirby & His Orchestra - Effervescent Blues. 8. The Bud Freeman Orchestra - The Eel. 9. Coleman Hawkins - Body & Soul. 10. Lionel Hampton - When Lights Are Low. 11. Tommy Dorsey - Our Love. 12. Gene Krupa - I'm Gonna Clap My Hands. 13. Glenn Miller - Little Brown Jug. 14. Eddy Duchin & Mary Martin - My Heart Belongs To Daddy. 15. Earl Hines - Grand Terrace Shuffle. 16. Mildred Bailey With Benny Goodman - I Thought About You. 17. Artie Shaw - Traffic Jam. 18. Jimmie Lunceford - Blue Blazes. 19. Wingy Manone - Jumpy Nerves. 20. Count Basie - Lester Leaps In. .
See also our other 80th birthday ideas.